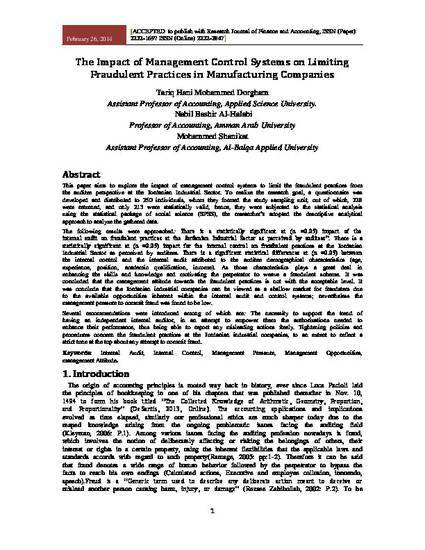 This paper aims to explore the impact of management control systems to limit the fraudulent practices from the auditee perspective at the Jordanian Industrial Sector.  To realize the research goal, a questionnaire was developed and distributed to 250 individuals, whom they formed the study sampling unit, out of which, 228 were returned, and only 213 were statistically valid, hence, they were subjected to the statistical analysis using the statistical package of social science (SPSS), the researcher’s adopted the descriptive analytical approach to analyze the gathered data. The following results were approached: There is a statistically significant at (α =0.05) impact of the internal audit on fraudulent practices at the Jordanian Industrial Sector as perceived by auditees”. There is a statistically significant at (α =0.05) impact for the internal control on fraudulent practices at the Jordanian Industrial Sector as perceived by auditees. There is a significant statistical differences at (α =0.05) between the internal control and the internal audit attributed to the auditee demographical characteristics (age, experience, position, academic qualification, income). As those characteristics plays a great deal in enhancing the skills and knowledge and motivating the perpetrator to weave a fraudulent scheme. It was concluded that the management attitude towards the fraudulent practices is not with the acceptable level. It was conclude that the Jordanian industrial companies can be viewed as a shallow market for fraudsters due to the available opportunities inherent within the internal audit and control systems; nevertheless the management pressure to commit fraud was found to be low. Several recommendations were introduced among of which are: The necessity to support the trend of having an independent internal auditor, in an attempt to empower them the authorizations needed to enhance their performance, thus being able to report any misleading actions freely. Tightening policies and procedures concern the fraudulent practices at the Jordanian industrial companies, to an extent to reflect a strict tone at the top about any attempt to commit fraud.